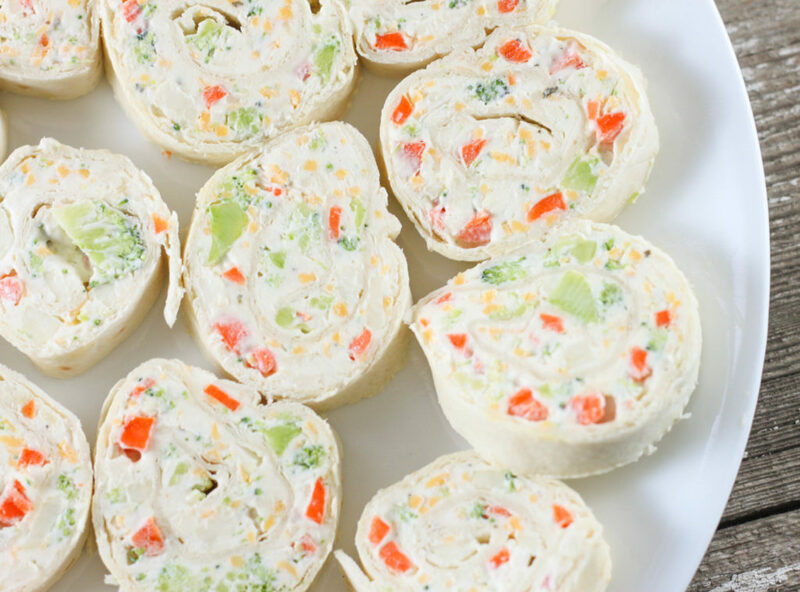 Veggie Tortilla Roll Ups have an irresistible ranch flavored cream cheese filling that makes a great after school snack or appetizer. 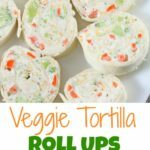 I am always looking for fun ways to get my kids to eat their vegetables and these roll ups are so tasty! These would be perfect finger food for a picnic and can’t wait for the weather to get nicer so we can have one! 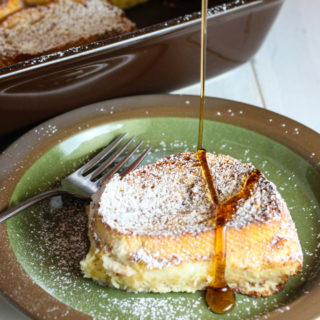 I found this recipe in one of my favorite cookbooks, a fundraiser cookbook that fellow farmwives and dairy farmers put together. The fundraiser cookbooks are always one of my favorites because everyone always send in their best recipes! The tip to making these roll ups is to not fill the tortillas too full. The more filling you place on the tortilla the more likely you are to get air pockets and mess up the pinwheel design. Cut the ends off and don’t include them on the display plate. In fact I normally eat those while I am cutting the others… shh don’t tell! You could easily make these a day ahead of your party and slice right before serving. 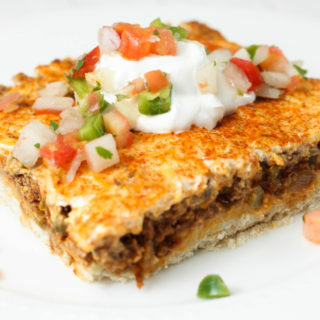 The sour cream could easily be substituted for mayo or another block of cream cheese based on your liking. 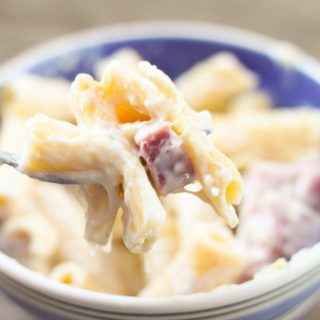 Combine the cream cheese, sour cream and ranch dressing mix and mix with electric mixer until blended. 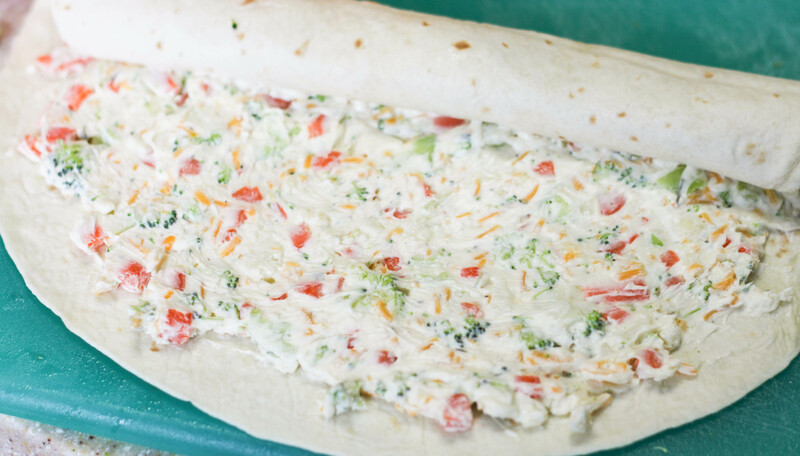 Add the broccoli, cauliflower, carrots and shredded cheese; and mix together. Spread the cream cheese mixture evenly over the tortillas; thin layers work best. Roll tortillas tightly placing seam down. Cut into 1/2 inch slices before serving. I love almost any kind of roll-ups. I had to make and try these first before commenting. They where…………well, let’s say………Delicious! I did add some finely chopped up black olives to the mixture but otherwise everything was the same. Will make again for sure, but for son-in-laws I will have to add some diced jalapeno peppers to the mixture. A person could even add some diced bell peppers as well to this mixture . If you don’t like the broccoli and / or the cauliflower just replace with something else. Will be making these along with other varieties of roll-ups when we have our barn raising. Glad you liked them! I love all kinds of roll-ups too! Thanks for letting me know how you got here! Yum! 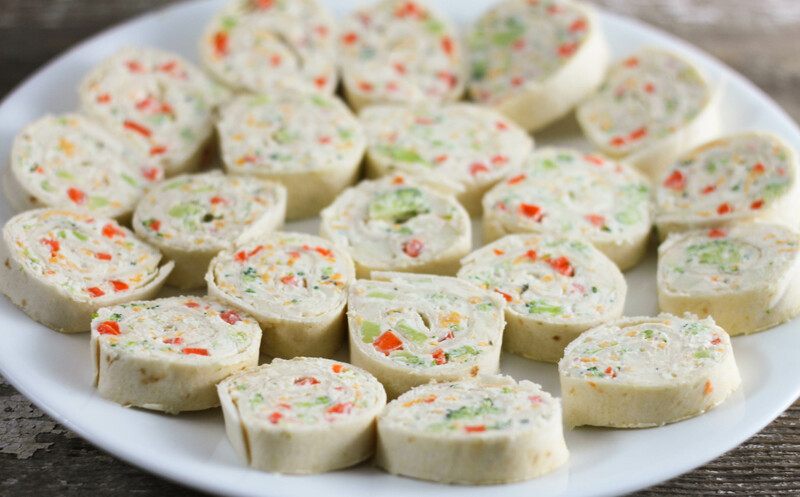 I replaced the cauliflower with red bell pepper and green onion, they were delish! 4th of July on a boat sounds perfect! Hope you enjoy!